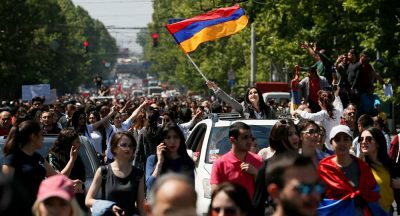 Thousands of people protested in the capital of Yerevan, some of them rather violently, to oppose former President Serzh Sargsyan’s appointment as Prime Minister following the implementation of the 2015 constitutional reforms that make the premier the most powerful person in the country. Some people considered this to be a bid by the long-time politician to remain in office under a different auspice and without having to go through the democratic process, seeing as how parliament appoints the Prime Minister whereas the President is still directly elected, and it’s because of this heavy pressure why he resigned. Nikol Pashinyan, the veteran politician leading what he’s self-described as a “velvet revolution” and who was instrumental in 2015’s so-called “Electric Yerevan” Color Revolution attempt, was the public face behind this campaign, even though the former premier made a strong point that the man whose party only won 7% of the vote in the last election has no right to speak on behalf of the entire nation. To Pashinyan’s “credit” though, he was very open about his regime change intentions and his movement was very successful in luring hordes of naïve youth into the ever-growing crowd. Those youngsters were understandably upset at the landlocked South Caucasian state’s stagnant economy, though their participation in the unrest was exploited in order to have them function as de-facto “human shields” protecting the older protest organizers, just like what happened in 2015. Moreover, it should be said that Armenia – just like Ukraine before it nearly half a decade ago – is split between East and West, and that this division is evidenced by the former Sargsyan government’s imperfect “balancing act” in trying to manage its membership in the Russian-led Eurasian Economic Union with its newfound EU relations through the “Comprehensive and Enhanced Partnership Agreement” (CEPA). This geostrategic “schizophrenia”, for lack of a better description, inadvertently destabilized the domestic political situation in Armenia by sending mixed signals to its citizens and provoking discord from all sectors of society, as it’s usually the case that no one is satisfied whenever indecisive leaders try to please everyone. This state of affairs has proven to be fertile ground for hyper-nationalists such as Pashinyan, who demagogically allege that the former government didn’t do enough to protect Armenia’s interests and should have responded in one way or another to Russia’s “military diplomacy” in maintaining the strategic “balance” between their country and its neighboring Azerbaijani foe. The international implications of Pashinyan or other hyper-nationalist pro-Western firebrands seizing power in Armenia in the aftermath of Sargsyan’s resignation can’t be downplayed because there’s a high likelihood that they could provoke a “Continuation War” in Nagorno-Karabakh in an attempt to drag Russia into a “Reverse Brzezinski” conflagration whereby it might get sucked into a regional quagmire in the Caucasus. Moscow’s mutual defense commitments to Yerevan do not extend beyond Armenia’s frontier to the disputed region within the internationally recognized borders of Azerbaijan, but nevertheless, the chaotic dynamics of any conflict are such that the Russian base in Gyumri might somehow end up playing a role. That said, the events in Armenia are fast-moving and becoming ever more unpredictable by the day, and the destabilization of this state isn’t at all to Russia’s advantage nor that of the emerging Multipolar World Order in general, but corresponds chiefly to the interests that the US and its allies have in provoking problems right in the center of the Russian-Turkish-Iranian Multipolar Tripartite at this sensitive geopolitical time.